Are you training the wrong way? Johan Lahti is taking a year off from his masters degree to coach at the Calgary Athletic Factory. Lahti sees working out as an experiment for the body. Take yourself out of the neanderthal gym-monkey mind-set and start thinking like an Olympian this season. 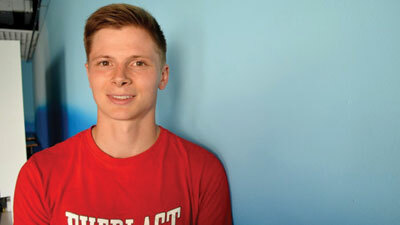 When setting your goals, there can be a lot more to getting in shape than lifting more weight or doing more reps. One in-training sports science master’s student, Johan Lahti, says working out can be seen as an experiment of the body, and that there are better ways than others to sculpt and hit peak performances. Lahti says that by only focusing on how much you’re lifting, and not on how you are lifting, you can actually harm your body, rather than help it make progress. Internally, you might be harming your muscles, even if you’re not feeling any pain. Talking to a professional is one of the best ways to break old habits and to avoid long-term injury. “Most people do not invest in experts teaching them correct form until it’s an issue,” says Lahti. The sporty scientist says that to be the best you can be, you should be investing in your body for the long-term. He says personal training sessions are a good start, but to get the biggest bang for your buck, strength and conditioning sessions are where you’ll see the greatest return. This year, Lahti will be completing his masters in his home country of Finland. Currently, he taking a year off from his degree to work at The Athletic Factory in Calgary. The opportunity is allowing him to gain high-level practical experience for his thesis as a strength and conditioning coach. He says there is always something new to learn. In 2011, when Lahti first visited Canada, he became infatuated with the intricacies behind effective training. To contact Lahti for training sessions and pricing, reach out to him on his cell at 587-432-4218 or email him at johan.lahti@theathleticfactory.net. Mount Royal University also offers training consultations. For more information visit mtroyal.ca’s personal training page.